We all know that liberals and conservatives are far apart on health care. But in the way their brains work? Even in automatic reflexes, like blinking? Or the way their glands secrete moisture? That’s the suggestion of some recent research. It hints that the roots of political judgments may lie partly in fundamental personality types and even in the hard-wiring of our brains. Researchers have found, for example, that some humans are particularly alert to threats, particularly primed to feel vulnerable and perceive danger. Those people are more likely to be conservatives. One experiment used electrodes to measure the startle blink reflex, the way we flinch and blink when startled by a possible danger. A flash of noise was unexpectedly broadcast into the research subjects’ earphones, and the response was measured. The researchers, led by Kevin B. Smith of the University of Nebraska-Lincoln, found that those who had a stronger blink reflex at the noise were more likely to take such conservative positions as favoring gun rights, supporting warrantless searches, and opposing foreign aid. That makes intuitive sense: If you are more acutely sensitive to risks and more fearful of attack, you also may be more aggressive in arming yourself and more wary of foreigners. Scholars also measured changes in the electrical conductance of research subjects’ skin, after they were shown images meant to trigger disgust — like a person eating a mouthful of worms. Our bodies have evolved so that when we’re upset, glands secrete moisture to cool us down, and that increases conductance. Liberals released only slightly more moisture in reaction to disgusting images than to photos of fruit. But conservatives’ glands went into overdrive. 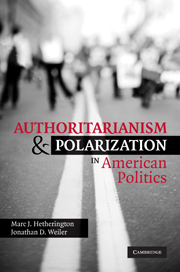 This research is tentative and needs to be confirmed, but it fits into a fascinating framework of the role of personality types in politics, explored in a recent book, “Authoritarianism and Polarization in American Politics,” by two political scientists, Marc J. Hetherington of Vanderbilt University and Jonathan D. Weiler of the University of North Carolina at Chapel Hill. They start by exploring data showing a remarkably strong correlation between state attitudes toward spanking children and voting patterns. Essentially, spanking states go Republican, while those with more timeouts go Democratic.